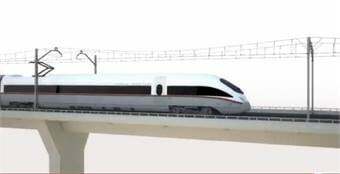 Rendering of Mexico high-speed train. MEXICO CITY — A Chinese-led consortium has won an uncontested contract for a multi-billion dollar high-speed passenger rail link between Mexico City and the central city of Queretaro, the Mexican Transport and Communications Ministry said on Monday, Reuters reported. The group led by China Railway Construction Corp Ltd was the only bidder for the 130-mile line, despite earlier interest from rivals like German conglomerate Siemens and Canada's Bombardier, according to the report. Mexico's government said on Monday the project would cost $3.74 billion, including the build cost and five years of operation.